Thanks to everyone who made the 9/11 - 9/15 events in DC a success. YouTube - Lt. Col. Bob Bowman: "Who Were the [9/11] Conspirators?" YouTube - Peace Activist Mario Penalver Reaches Washington, D.C.
Video: Peace Activist Elliott Nesch Reaches Washington, D.C.
YouTube - Tom Hansen Sings His Ballad, "False Flag"
Come to Washington this September for the historic union of the 9/11Truth, Peace and Impeachment movements. March with us as we honor the victims of 9/11 and the thousands of casualties of the illegal wars in Afghanistan and Iraq. 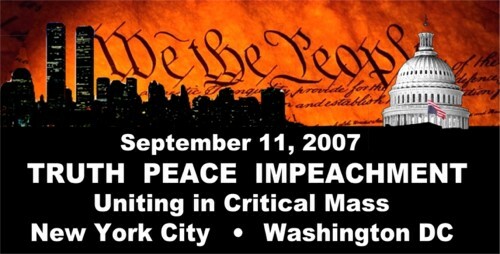 Demand that Congress investigate the omissions and distortions in the 9/11 report, end the so-called "war on terror," impeach the criminals in the White House and restore our constitutional rights. Come for the Truth, stay for the Peace and Justice! Pennsylvania Ave., in front of the White House. Bro. Elliot from Denver for Peace, 9/11truth and Bill McDannell who walked from San Diego to "End the wars." Special Musical Guest: The Ben Marble Band. Webster Tarpley, historian and author of, "9/11 Synthetic Terror: Made in USA"
Ralph Schoenman and Mya Shone, hosts of the radio program, "Taking Aim"
David Lindorff, co-author of "The Case for Impeachment"
Bob Bowman,Lt. Col USAF(ret. ), former head of Star Wars program. Carlo Hawk Walker, native American, Vietnam veteran and peace maker. William Pepper, Barrister and Lawyer, author of "An Act of State" and "Orders to Kill"
9am-12noon - Susan Udry, lobby leader for United for Peace and Justice; Tina Richards, military family lobbyist for ending the war; Dr. Bob Bowman; Ray McGovern, former CIA analyst and co-founder of Veteran Intelligence Professionals for Sanity. All-Day - Lobby your representatives. 7pm-9pm Speakers at the Stewart Mott House: Joan Mellen, Temple University Professor and author of A Farewell to Justice will give a talk titled: "Who Rules America? How Did We Get Here? "; followed by John Judge, researcher/investigator, Co-Founder of 9/11 Citizens Watch and Founder of 9/11 Research Project - speaking on "From the Inception of the National Security State to the Counter-Terrorism State". dc911truth was in the Takoma Park, MD 4th of July parade. dc911truth had a "float" in the Takoma Park Fourth of July Parade! The Truthmobile was greeted with wild applause and "thumbs-up" and other signs of approval from the crowds gathered all along the parade route. 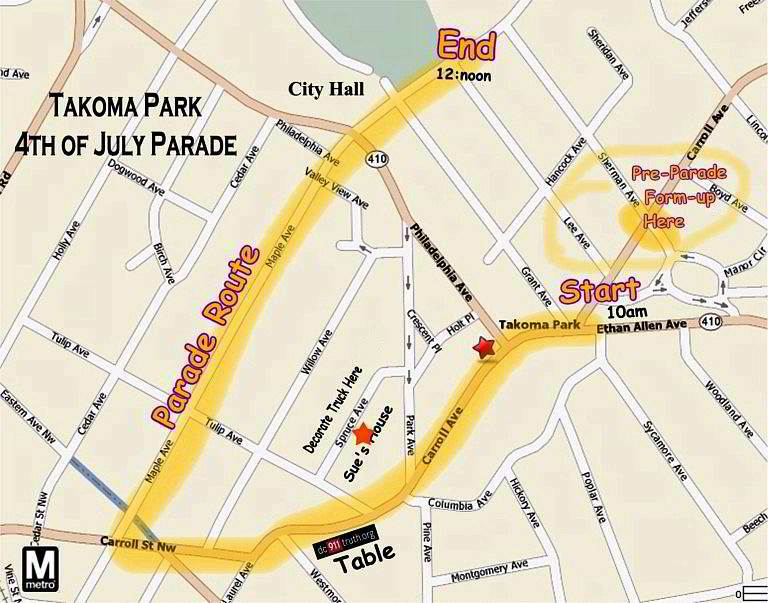 The route of the parade, a mile long "U" shaped path, travels down the main streets of Takoma Park, Maryland, dips just into Washington, DC and then back to the Takoma Park City Hall. 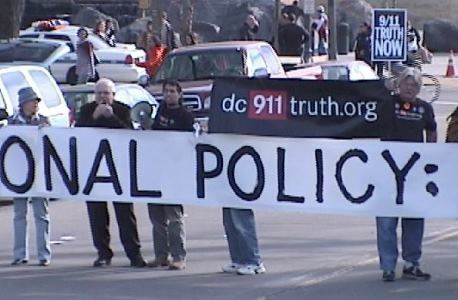 As the float passed the reviewing stand, loud speakers proclaimed that "dc911truth.org is a grassroots organization of citizens, activists, and researchers seeking to raise public awareness of the historical context of U.S. false flag terrorism, culminating in the events of September 11." 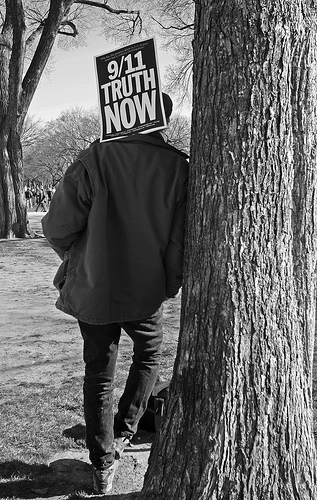 dc911truth held another in a series of rallys in front of the White House from 1:00 p.m. to 2:00 p.m. this Saturday. The aim of the rally was to condemn the current administration for their use of false-flag terrorism, and to alert the public to the likely use of false-flag provocations against Iran in the coming days and months. dc911truth members passed out flyers and information cards to curious tourists and school groups in the vicinity. We will hold another rallynext Saturday at 1:00 p.m., and every Saturday leading up tothe march on the Pentagon, March 17th. Join us next Saturday at 1:00 p.m. in front of the White House. 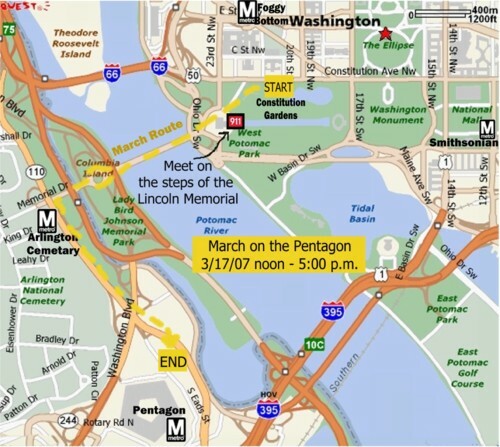 Our next major event will be participation in the March 17 peace march on the Pentagon, sponsored by the ANSWER coalition. 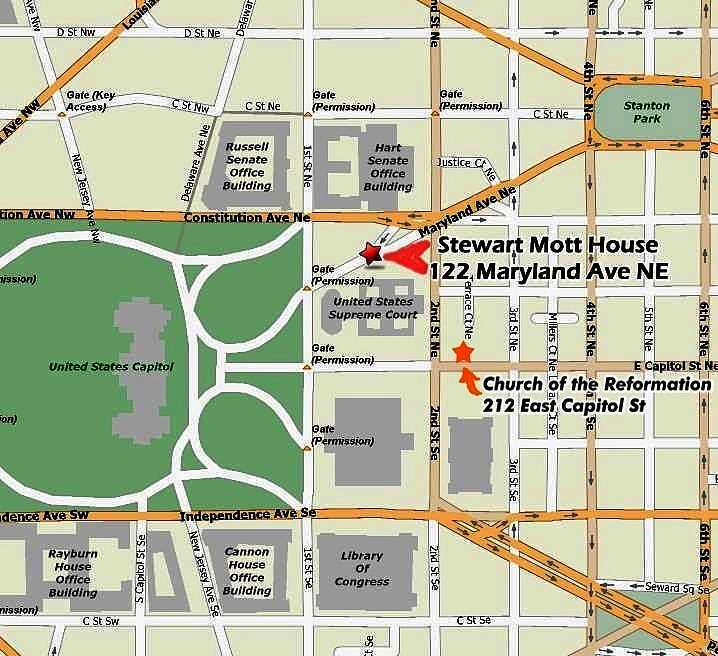 Join dc911truth for the March 17 demonstration. Meet up on the steps of the Lincoln Memorial between 11:00 and noon for a rally and photos. March with dc911truth and other 911truthers from around the country as we call for an end to war and an end to state sponsored false-flag terrorism. The march was a great success. Thanks to all who participated. dc911truth hosted a series of activities over the weekend of January 27-28 in support of the national 9/11 truth movement outreach to the peace movement. 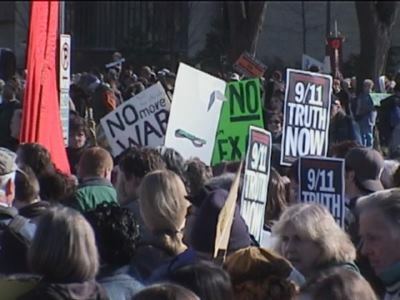 The general consensus is that our efforts were a great success.Awareness of 9/11 truth issues within the peace community is quite highand acceptance of 9/11 truth as a legitimate peace issue is near 50%. dc911truth will continue our efforts to educate the public about thehidden history of 9/11/2001 as we forge ahead. We hold meetings everyweek which are open to the public. If you live in the DC area you are invited tojoin us for a lively discussion of the issues. Our next public event will be participation in the March 17 peace marchon the Pentagon, sponsored by the ANSWER coalition. dc911Truth will host a series of activities this weekend in support of the national 9/11 truth movement outreach to the anti-war movement. On Saturday, January 27, 9:00 a.m. gather; 11:00 a.m. UFPJ rally begins; 1:00 p.m. march begins. We will be joining with 9/11 groups from NYC, Boston, Philadelphia and beyond,to spread the truth of 9/11 among the peace protesters who will be gathering on the National Mallin Washington. Bring your own outreach materials, flyers, banners, DVDs etc. Look for the dc911truth table on the Mall, at the end of the Mall nearest the Capitol, near the American Indian Museum. (see map)We will have DVDs, flyers, information cards, buttons, banners, books, magazines, newspapers and all sorts of 9/11 truth materials.Look for the black and red dc911truth.org banner, the 911ShareTheTruth table or any ofthe many other 9/11 truth tables. On Saturday evening, dc911truth.org will host a movie and speakers forum at the Takoma Park City Hall, three blocks north of the Takoma Park Metro Station. 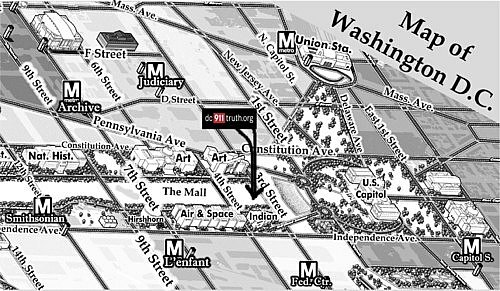 On Sunday morning, dc911truth.org will host a full breakfast event atCapitol City Brewery, in the historic office of the Postmaster Generalright next to Union Station, blocks from the Capitol. The cost for the Deluxe breakfast is $25. Craig Hill, Green Party candidate for Senate from Vermont, and Webster Trapley will speak. On Sunday, UFPJ will host training for lobbying your congress people. On Monday, January 29, lobby your congress person and Senators. Rooming accommodations: On the UFPJ site there are listings of inexpensivehotels etc. in the Washington area. For dedicated 9/11 truth activists who want toparticipate in the whole weekend of activities, and help with setup, teardown and everything in between, we may be able to offer you a place to stay. Please e-mailcontact@dc911truth.org with your info, who you are, where you're coming from, and what nights you need, and we will try to match you up with amember of dc911truth who has room for you. We're not a hotel but if you don't mind sleepingon the couch we'll try to accommodate you. Quality prints available from DC 9/11 Truth in bulk. Order a batch of 200 professionally printed brochures for $15 (7.5 cents each, at cost), plus shipping.